Ferry to Phi Phi Islands leaves at 8:30 AM and the pier is close to the hotel. It will take us to the islands in two hours. We’ve got a bungalow over the white sand of the beach, so we will enjoy it. In our walks in the island we will look for a way to go to Maya Bay in the inhabited island in front of us. We wake up in this old and spacy room from which we can hear the storm through the window. I’m upset about this rain as we’ve chosen the dry season just to avoid the rain on the beach days, and today is the first of these days. We go downstairs for the breakfast buffet which can easily be the best of this hotel and then go to the room to getting ready our baggage for the departure. Then I ask in the desk about the ferry and I’m answered they offer me the tuk tuk to the pier and the ferry tickets by 1000 Bahts in total but, as I already know the ferry is 350 Bahts per person I just tell we’ve already got the tickets and only need the transport. The tuk tuk take us to Rassada Pier by 80 Bahts in a 5 minutes’ ride. Once there I find a lot of stands from travel agencies selling the ferry tickets by 600 Bahts per person. Same price in all of them and I deny their offer every time as I’m thinking about finding where to purchase the official tickets somewhere here. While I’m exploring the only building I can see empty departments everywhere except for an office signed as “Information” with two guys playing in their computers. I ask them about where to get the ferry tickets and they answer me in perfect English that I can do it in any of the stands outside. Then I explain those are selling the tickets by 600 Bahts as the real price is 350 and, since this very moment, they forget all their English and just do gestures meaning they don’t understand me. Awesome! I spend the hour until ferry time, 1:30 PM, thinking about the tickets. I don’t want to give up to these people. By internet it was cheaper, even including a taxi transfer from our hotel and here seems to be no more options than paying the 1200 Bahts. As we’re getting the ferry scheduled time I’m expecting one of these two things to happen: touts here make their prices lower or ferry arrives and tickets can be purchased on it with their real prices. But none of these happen. People board to the ferry and we finally pay 1200 Bahts for our tickets as we cannot find any other choice and must be on that ferry. The woman we discussed most about this is talking with all the stands, each of them has a different logo and agency name but now, at the end, it seems all of them are together on this. Once on the boat a look around in case I can see another ferry coming, but it doesn’t happen either, so we leave Phuket without knowing how the real tickets purchase works there. 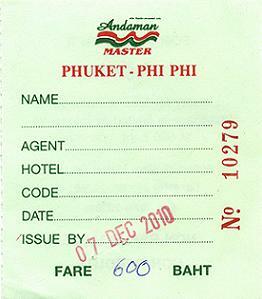 It seems at pier you can only get 600 Baht tickets as by internet or in the hotel you can deal a much better price. Now is time to enjoy the trip. It’s cloudy, but it’s not raining any more. There is a big roofed hall with seats in this ferry, but with the typical freezing air conditioning inside, so we go at open air with the beautiful landscapes made by these big rocks emerging from the sea. We can check our bags from here too, although they’re buried under a big mountain of baggage. This is how it works here: they do three bag groups on the floor and at open air: one mount with the ones labeled as “Phi Phi”, another one with the ones labeled as “Ao Nang” and a third one with the bags going to “Koh Lanta”. I’m feeling some pain in my elbow when I rest my arm on it, so I’m not doing it. After a trip of two hours the boat gets Phi Phi Don Island on time, at 3:30 PM, after seeing some of the landscapes of this tiny island. It is small on maps, while here it is looking quite large. Its skyline looks as the picture, with this jagged shape. When reaching the pier in Tonsai Bay, the landscapes are made by tall riffs of rock with this rainforest vegetation on top like if it was its hair. Out of the boat people is forced to live the pier in queue as everybody must pay a 20 Bahts conservation fee in a table. Then we leave the crowded pier, full of people offering accommodation in the island and take the path at left where I know sooner or later will find our bungalow. As the ground is made by sand in a lot of parts, the help of the wheels in the bags is useless. Locals are using this same path too, carrying trolleys with things like ice or fruit and some other are riding a bycicle. When we’re reaching the end of the beach I can see the bungalows, and only then, read the small wooden sign with the name of the place: Sand Sea View Resort. There is wooden table on the beach as reception desk. The guy taking us to our bungalow and helping us with our baggage removes the sand on the terrace of our bungalow with the water from the hose installed in all the bungalows for that. So, it is relax time: shoes and clothes off, we only need our swimming suit here. Although we need to do something first as we’re starving. We walk the same path when coming to get the village, which basically is where the businesses here – small travel agencies, diving, massages, restaurants, souvenirs shops… - are all concentrated. We get into the first restaurant we’re agreeing with the menu prices. It’s called “Amico Resto” and here we eat seafood spaghetti with a Singha beer for Eva and tuna fish pad thai with a coke for me: 375 Bahts, and the spaghetti costs 200 Bahts by itself! We’re happy and, although the waitress is not the most likeable person, the food is very good. Actually, Eva says these are the best seafood spaghetti she never tasted. Also, the restaurant has got a terrace with views to the sea, although it is difficult something here has no views to the sea. Somehow, my elbow’s pain is getting worst and it hurts with the softest touch with the table. 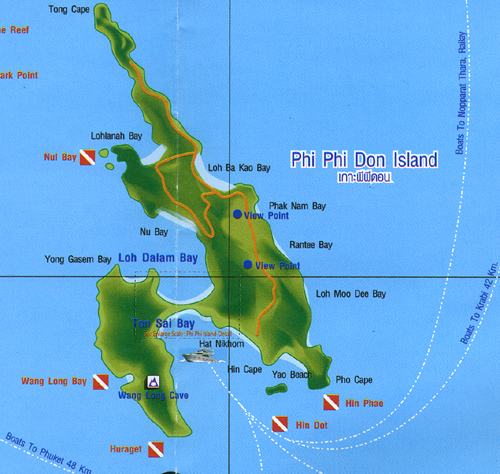 Phi Phi Don is shaped as letter “H”, with one side quite longer than the other. The horizontal line is a tongue of sand with bay at both sides and is on it where this village is sited. With full stomachs we go to explore the other side, the one of the pictures below: Lodalum Bay. Here are pubs and a Seveneleven where I get an ice cream. There are a lot of activities to do here. We’ve discarded a trip to Phi Phi Leh because my wife was right when saying: “we’ve just arrived to a paradisiac island and you’re thinking about going to another one?!”. We’re going to spend just one day here and we’re going to fully enjoying it. I’m attracted by a tour called “Breakfast with sharks”: at 5 AM we go for snorkeling on a pool where some small and harmless sharks go to feed. But we are finally going to enjoy and relax here and no waking up that early. Lodalum Bay looks like naked now: almost everything is sand and longtails must wait for the water coming back tomorrow to be floating again. There are some people around looking at the little crabs on the sand and we join them on this. Somehow we are worried about the pain in my elbow as it is hurting more every time, but now it is swollen and looking bruise and I feel like if the pain is extended all over my arm. I always try to avoid going to any doctor, and in such isolated place even more, but then I think there are some “weird” bugs here and we need to know what is happening. So we go to hospital, which is the hut in the picture below, which we already knew because we passed by its door twice this afternoon. I don’t need to talk in here, just showing my elbow everybody understands what I’m looking for. I’m pointed to seat in a chair and wait. When it is my turn I’m assisted by what I thought it was the receptionist from the beginning – and she still may be -. She checks my elbow and surprises when touching it about how it is burning and ends with this diagnosis: “This can go worst or better. If tomorrow it is worst come back and if it is better don’t”. I wanted to say I was not going to come back whatever direction my elbow will take, but I just smiled and leave hoping if, at least, she could identify if it is a beat from some animal. Once in our bungalow, I use the internet connection to make my own investigation about it. I find the word “bursitis” which matches with what is happening to me, but it is not produced by any animal beat but by some kind of hit or something and it is then, and only then, when I get a flashback from last night where I can remember how I hit my arm with the bedside table when sleeping and I don’t get completely awaken, but I know it must hurt because I remember to scream in the middle of the night. This memory has been hidden to me the whole day just to annoying me and the designer of Phuket hotel rooms has something to say here too when decided bedside tables taller than the bed are ok. I’m kind of amazed by being capable of sleeping so deep that this tremendous hit wasn’t able to waking me up. Now we are in relief about my problem we go out for dinner. The area is dark at night until we reach the beginning of what I’ve been calling “village”. Here we get into a restaurant on the beachside – of course –which has fresh fish and seafood in display and we must take our shoes off before putting a foot on the wooden floor. One hour and 500 Bahts later we’re walking around to see the night live in the island. The street with more live is one in the right part of Londalum Bay in the map. Here we’re getting flyers from every club. It seems there is a disco everywhere in this street and the music from all of them mixes in the air. When we reach the beach we can see the lights, the hard music and the fire shows. It is incredible can be such a party in this small piece of land in the middle of the sea. While we’re leaving the place, walking by the sea shore to the other side of the beach we’re meeting boys with bottles or girls – or both –. In the opposite side, and just before crossing to Tonsai beach, where is our bungalow, we take a last look at the lights in the other side and music now sounds vague and far. We’re going to bed now.